Come check out the Aiken County Visitors Center Monthly Artists Exhibit displaying a new Local Artist each month. For the month of May we will have Phil Yarborough. His artwork will be displayed until the end of May. Make sure you stop by and see how talented he is. Our business hours are Monday-Friday 8:30am-5pm and Saturdays 10am-3pm. 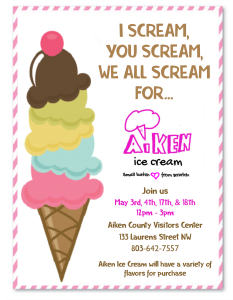 Join us at the Aiken County Visitors Center on May 3rd, 4th, 17th & 18th for some good ole' homemade ice cream from AIKEN ICE CREAM! They will be here with a variety of flavors available for purchase.